Welcome to our Game In Progress review of Final Fantasy XV. Over the next several weeks, Gameological contributor Patrick Lee will be playing through Square Enix’s latest epic and reporting in along the way to write about how it’s shaping up. This debut installment covers the game’s first 10 hours. Final Fantasy XV begins with a promise. Perhaps, after 10 interminable years of development and a change of both name and director, it feels it needs to. Before the title screen even comes up, in plain white text on a black background, it assures us that this will be “a Final Fantasy for fans and first-timers.” This promise speaks not only to the game’s desire to be accessible to series virgins and veterans alike, but of its desire to bridge the past to the present—to have sufficient reverence for Final Fantasy’s history without being so bogged down in it that the game fails to adapt to the times. After 10 hours, it’s a promise Final Fantasy XV has managed to keep. Where FF15 is most rooted in history is its story. Per the series’ more recent tradition, the nittiest and grittiest of details and lore are bound up in jargon and nonsense that are never usefully explained, but the broad strokes of the actual plot retain Final Fantasy’s knack for mythic simplicity. An evil, technologically advanced empire has invaded a peaceful, magic-using kingdom, so deposed prince Noctis and his fashionably coordinated entourage must travel the country to collect the mystical gewgaws that will enable them to fight back. Whether any head-spinning plot twists or incomprehensible developments are in store is yet to be seen, but so far, “drive around the countryside with your buds collecting magic swords” is all the motivation needed to start exploring FF15’s often astonishingly beautiful world. That world is one of the many things that sets Final Fantasy XV apart from its forebears. For a Japanese series, Final Fantasy has traditionally had a very European atmosphere, dealing in the imagery of high-walled stone castles, lush Christian-style cathedrals, and little towns with cobblestone streets. So far, this 15th installment is more of an American fantasy pastiche than a European one. Not that friends don’t drive cars great distances in other countries, but the idea of a road trip is tinged with nostalgic Americana, and the design and decoration of the game’s world bears this out. Shoddy motels and campers replace the inns of classic Final Fantasy, and the gang gathers local rumors at roadside greasy spoons instead of pubs. Even the landscape is like a hyper-condensed America in which the coniferous forests of Oregon, the dusty mountains of Nevada, and the kettle lakes of Michigan are no more than a 10-minute drive apart. The game’s combat system is another aspect that has been aggressively updated. Battles in Final Fantasy XV are carried out in real time, and it trades the methodical, lightly strategic approach of the series’ turn-based entries for something chaotic, demanding, and vicious. Once the introductory chapter ends, enemies become large, fast, and sturdy. They hit hard and often. Even in workaday battles, you’ll need to use every tool on your belt to survive—Noctis’ various magical skills, his ability to parry and counter opponents’ attacks, the strategic advantage gained by attacking enemies’ backs or exploiting elemental weaknesses, and your party’s powerful team-up special attacks are all vital. It can be a lot to keep track of at first, and early battles may seem like untactical nonsense, but with practice and experimentation the nuances come to light one by one, eventually revealing a system that is fast, fluid, and intensely rewarding when done right. Teaming up for attacks isn’t all Noctis’ friends are good for. In fact, they’re the heart of the entire game so far. 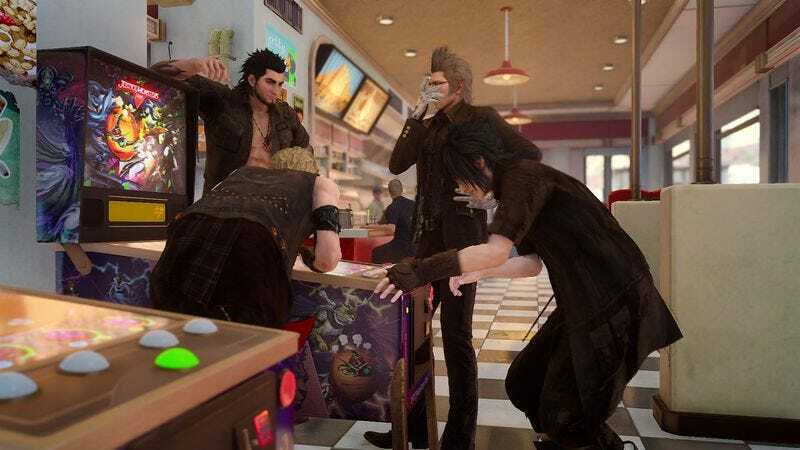 If anything in Final Fantasy XV genuinely feels like it was worked on for a full decade, it’s the core cast’s sincere, deeply authentic friendship. Each member of the party is gifted with unique body language, hobbies, interests, spot-on vocal performances, and inner lives they occasionally let peek out. In the field, they banter constantly, to a degree just short of being annoying—although it passes that threshold when certain exchanges begin to repeat themselves. When taking prolonged trips by car, they often just chill out. The brawny Gladio will sometimes read a book, and energetic Prompto occasionally asks if you can pull over for a photo op, but the extended comfortable silences between the pals says as much about how close they are as any scripted quip. After 10 hours, Final Fantasy XV has a busywork-to-plot ratio of around 10:1, and that feels about right for being this early. It emphasizes what are so far the game’s greatest joys: cruising around with your homies, seeing the sights, fighting the occasional wave of enemy robots, and riding giant yellow chickens around in the desert. The next ancient mystical thingamabob may be right around the corner, but frankly, right now I’m content to continue sightseeing. Perhaps the game’s lack of urgency, the feeling that our heroes are free to waste all the time they please fishing and camping, will come to hurt the experience as the paint-by-numbers evil-empire plot inevitably takes a bigger role. For now, the next quest on the chopping block is a walking tour of a luscious, New Orleans-esque metropolis led by a goth schoolgirl, which sounds like the ultimate distillation of what are, so far, Final Fantasy XV’s greatest strengths.